This past weekend I ran part 1 of the Lost Mine of Phandelver with three avid 5E play testers and three veteran returning players. We used the pre-made characters provided with the starter set and my wife rolled up her own character. Five of the players were physically present and one Skyped in from out of state. After they all selected characters I spent about ten minutes explaining some of the rule changes and then we jumped right in. WARNING: Spoilers past this point! Just for background one of the things I immediately liked about the Lost Mine of Phandelver adventure booklet was how easy it was to read. Since it was filled with helpful tips to assist a new DM I really just skimmed it a few hours before game time. Admittedly, I did not follow the adventure and changed things as I saw fit based on player interaction. Hired by a dwarf in Neverwinter to bring a wagon of supplies to Phandelver the players set off. Eventually they happen about a grisly scene on the road consisting of black feather laden horse corpses. At this point the curious halfling rogue in our group went up for a looksee. Unfortunately she suffered the ambush of the goblins hiding in the thicket. Luckily one of the fighters with a longbow had been perched on top of the wagon the entire trip. Some return fire felled one goblin and provided some suppression for movement. Eventually hide and seek ensued in the thick underbrush ending in a melee. I enjoyed the first encounter and I think it was well thought out to introduce new players to some important concepts. Sure the old vets in my group immediately realized they were being funneled into an ambush. That being said, new players need to learn that an opponent with a ranged weapon using cover and concealment is devastating. I think this encounter will be an educational experience for some groups! Afterward the stalwart adventurers hobbled the oxen drawn wagon inside a thicket clearing and followed the goblin trail. Passive perception saved them from some nasty goblin traps along the way. The traps are another good primer for new players as they will learn that danger can take many forms. Just because it looks like a safe trail to follow does not mean there is not a big pit trap waiting to swallow you up. Finally the group located a large cave which a shallow stream flowed into. This was the Cragmaw Hideout where the goblins and their bugbear boss were holed up. Without giving too much more away about the actual interior I will say there is a few surprises which I thought were fun. I think part 1 was a good mix of exploration and combat with part 2 potentially involving lots of investigation and roleplaying opportunities. 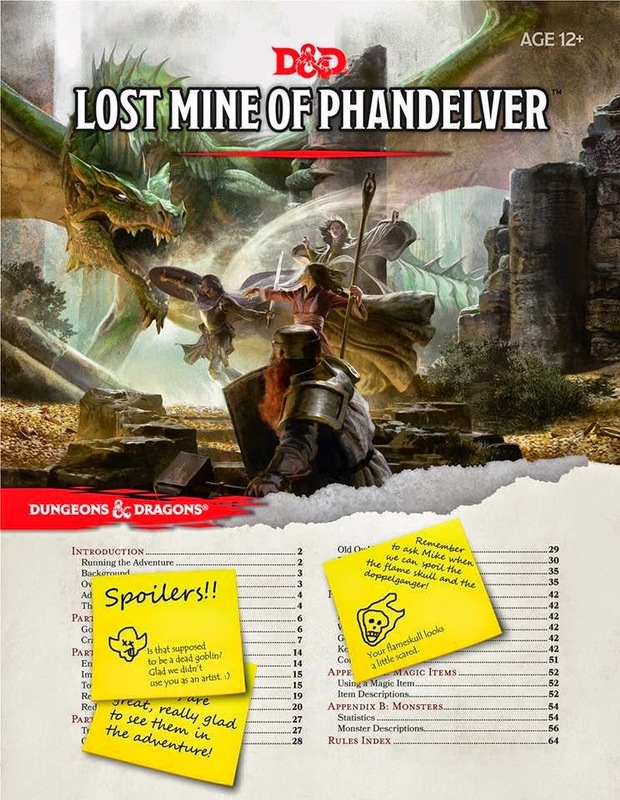 Overall the Lost Mine of Phandelver is a solid product to teach new players the game and also entertain veteran players alike. Sometimes reaffirming those old school values of combat, exploration and role-playing is even good for the grognards. Sweet! Good write-up, man. Just did mine. Thanks! Checking your site now!